The Devils are inching closer and closer to that elusive playoff spot. Tonight, they came away with a close one in Montreal, defeating the Canadiens 2-1 on a late Taylor Hall shorthanded goal. The Devils now stand with four as the magic number: any combination of four points lost by the Florida Panthers (who were idle toinght) or won by the Devils will get them in. Florida does have two games in hand, but they come against teams like Nashville and Boston as well as Buffalo and Carolina. Not easy sledding for them, or for the Devils for that matter. The Devils just need to put their head down and go about their business and things will fall into place. But first, tonight’s game. Some injury news to begin: Kyle Palmieri, who was clipped by an errant Andy Greene stick last night and was cut. The Devils wanted to take all precautions with him so he did not travel with the team to Montreal, however he was flown in once he was cleared and good to go. He wanted to play and was eager to be in the lineup. Also, some other good news as Marcus Johansson was cleared to play and taken off of injured reserve today. He was a healthy scratch for this game, along with Jimmy Hayes, Drew Stafford, Brian Gibbons and Damon Severson, as the coaching staff want to make sure he’s just right to get in. He did travel with the team to Montreal. With Gibbons out, Jesper Bratt slotted back in at forward and with Severson out, Ben Lovejoy was back in on the blue line. Palmieri played on a line with Pavel Zacha and Michael Grabner while Patrick Maroon moved up to the top line with Nico Hischier and Hall. In net, Keith Kinkaid made his third back-to-back start in as many weeks. He made 25 saves on 26 shots and was again brilliant at times. Opposing him was Carey Price, who tied Jacques Plante on the Canadiens’ all-time games-played list with 556. He was also fantastic for them, stopping 30 of 32 shots. Special teams played a huge role in this one, as the referees certainly did not put the whistles away. The Devils ended the night 0-for-5 on the man advantage, with 11 power play shots. They also scored on their only shorthanded shot of the night, which we will get into in more detail later. Montreal was 1-for-4 on the power play with nine shots. The Habs are on pace to finish with the fewest points by a Montreal team since the NHL went to an 82 game schedule in 1995-96. The Devils pushed the pace for most of the game, but things looked bad early on as Montreal got on the board first. It was the power play goal, scored at 19:51 of the first when Kinkaid drew a tripping penalty. Travis Zajac and Grabner were on a shorthanded 2-on-1 and Grabner’s pass was blocked, allowing Montreal to take the puck up the other way. Daniel Carr buried one from Arturi Lehkonen and Mike Reilly then. But the Devils used their coach’s challenge, claiming offsides. The review was inconclusive to the linesmen who watched the replay, and, thus the call on the ice stood. It was a good goal and New Jersey was assessed a delay of game penalty. This was the first time coach John Hynes had tried to challenge for offsides against an opponent, but the Devils were right back on the penalty kill. Plus, they were down 1-0, the first time this season the Devils had trailed the Habs in regulatioin according to Deb Placey of MSG+. The Devils had their chances to break through, but it was not until the third period that things would begin to click for them. First, they tied things up 26 seconds into the third stanza. Nico Hischier scored from Sami Vatanen and Kyle Palmieri to even things up at one. Hall won a board battle in the far corner, pushing it towards Palmieri, who quickly wound it around the boards to Vatanen at the near point. He fired a quick one and Hischier, who was camped out in the slot, was able to get a stick on it and redirect it by Price. The game was knotted up and for the next few minutes, it became the Nico Hischier show. He began by coming in on a breakaway midway through the third. Price stopped him as Nico elected to shoot instead of deking. A few minutes later, Nico would clang one off of the iron on another glorious chance. But the game winner was set up by a penalty, or rather two penalties. Not to the Canadiens, but to the Devils. At the 13:45 mark of the third, the Devils were given a bench minor for too many men on the ice. That would be served by Hall (which would turn out to be a brilliant move on Hynes’ part). A little over a minute later, at 14:53, Lovejoy was called for cross checking Brendan Gallagher on a play in front of Keith Kinkaid’s net. The Habs would have 52 seconds of 5-on-3 power play time and it looked like the game hung in the balance. The Devils would kill off the too many men penalty with Zajac blocking one final 5-on-3 shot by Montreal. He calmly gathered the puck and saw Hall coming out of the box. He saucered a pass directly to him, springing Hall for a breakaway. All alone in on Price, Hall beat him stick side to put the Devils up 2-1. It was a well-timed play by both Zajac and Hall, and a nice one. Credit to the Devils’ PK unit for keeping the puck out of their own net. It was also a smart move by Hynes. Having a choice of who to put in the box for the bench minor allowed him to get his best offensive player, who does not generally kill penalties anyway, a jump start to come out of the box on a break. Zajac timed the block and pass so well and Hall was there to finish. The goal came at 15:53 of the third with the only assist to Zajac. It was shorthanded, so the Devils still had the Lovejoy penalty to kill off, which they would. With that shorty, the Devils notched their 12th shorthanded goal of the season, taking over the lead in the NHL. Price would be pulled with about a minute left in the game, while Montreal was killing off a Nicolas Deslauriers slashing penalty, but were unable to tie things up. The Devils came away with points 92 and 93, putting them one behind the Flyers for the first wild card spot and seven ahead of the Panthers. Statistically, the Devils won 47-percent of the game’s faceoffs and out shot Montreal 32-26. They were out hit 40-18 by the Habs, but the Devils had more blocked shots with 17 to Montreal’s 15. Greene led the Devils in ice time with 23:15 (inlcuding 45 seconds of power play time and 4:50 on the PK). He narrowly edged Vatanen, who had 23:06 of ice time. Vatanen did lead in shots on goal with seven, while Stefan Noesen and Zacha led in hits with three each. Greene and Mirco Mueller led the team in blocked shots with three apiece while Grabner, Lovejoy and Vatanen each had one takeaway. So, next up, the Devils take on their rivals, the Rangers, Tuesday. While the Rangers are long out of the playoff race – having been eliminated the night the Devils beat the Hurricanes at home – you can bet that New York will be looking to play spoiler against the Devils. This will not be an easy one, but if the Devils come away with the two points, it will be very much worth it. Note: if you enjoyed this post, feel free to contact us. You can follow us on Twitter @LGDevilsNet, email us at LetsGoDevilsNet@gmail.com or simply leave a comment in the section below this post. The New Jersey Devils had lost three in a row with a rough stretch of games staring them right in the face. There was this homestand where the Devils faced high-powered teams like Vegas and Winnipeg. And then there is the western road trip against Nashville, the California teams, Vegas and then ending in Pittsburgh that could make or break this season. Coach John Hynes did not want to use the word “desperate” – saying that that sounded like the Devils were not in control – and preferred the term “urgent” instead. But simply put, the Devils needed this game tonight against a weak and depleted Montreal squad. They got the two points, defeated the Canadiens 6-4 following a late surge by the Habs. It was a special night at The Rock as the Devils were honoring the women’s US Olympic hockey team who won gold in South Korea last month. The eleven members of the team that were there talked to young female hockey players before the game and were on the broadcast talking during the pregame and the first intermission to Deb Placey and Bryce Salvador of MSG Network. They also participated in a ceremonial puck drop between Devils captain Andy Greene and the Canadiens’ Brendan Gallagher and were there to generally promote women’s hockey. With Team USA defeating Canada for their first gold medal since 1998, the women’s game has never been stronger. The Devils made some changes to their lineup with Jesper Bratt slotting back into the lineup (in for Drew Stafford) and back on the top line with Taylor Hall and Nico Hischier. Hynes switched up some of the lines with the second line consisting of Michael Grabner and Kyle Palmieri centered by Pavel Zacha. The Canadiens were without the injured Max Pacioretty and Shea Weber (who will be missed for the rest of the season). They were also missing goaltender Carey Price to injury. In his place started Charlie Lindgren who stopped 27 of 33 shots faced. For the Devils, Keith Kinkaid went as Hynes said that he wanted Cory Schneider to practice more to get some of the rust off of him. He also felt that Kinkaid deserved another start (his career high 28th appearance) in light of how he has played of late. He made 29 saves on 33 shots. So with the Canadiens making their only trip to Jersey this year, the Devils were ready to go. It only took to the 8:25 mark of the first period for Stefan Noesen to get the Devils on the board, getting assists from Will Butcher and Travis Zajac. The goal came when Zajac won a battle along the boards in the far corner. He slid it to Butcher at the far point. Butcher fired a shot on goal that was tipped in front by Noesen to make it 1-0 Devils. As Ken Daneyko pointed out on the MSG telecast, it was all made possible by Zajac’s strong play along the boards. Butcher’s assist on that goal would be his first point in 12 games. He had a good game and also took a puck to the face for which he would leave briefly to get repaired, but would return. The Devils’ other Plano, Texas import, Blake Coleman, would give them their second goal at the 16:33 mark of the first off assists from Butcher and Brian Boyle. That one developed when Boyle came down the right wing and made a move to drive around the Montreal net, coming out from behind and giving the puck to Butcher at the far point. Butcher fired on net again (something Hynes said that the coaching staff had asked him to do more of) and Coleman buried the rebound to make it 2-0. 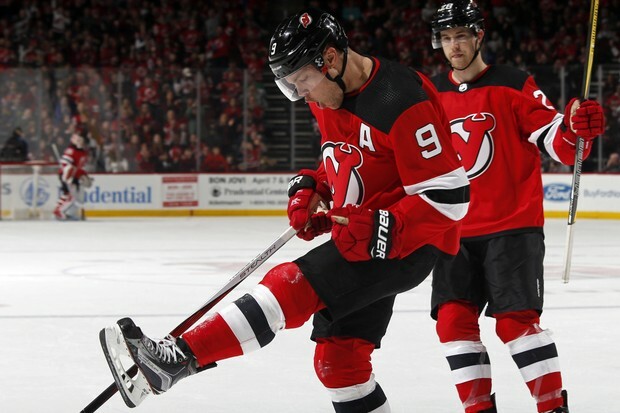 The Devils’ onslaught would continue in the first period as Zajac notched his first of two at 18:08 of the first from Palmieri and Sami Vatanen. That one came on the power play – set up when Jacob de la Rose was called for slashing. On that one, Hall stickhandled into the Habs’ zone along the near boards. He dished to Vatanen at the point. Vatanen gave to Palmieri at the top of the far faceoff circle. He fired, with Zajac tipping the puck by Lindgren with Patrick Maroon providing a screen in front. It was now 3-0 Devils. The Devils would build up a 4-0 lead with Zajac’s second of the game. He scored with 12 seconds remaining in the first from Hall and Vatanen. This one also came on the power play, as Montreal’s Andrew Shaw had gotten a double minor for high sticking Greene and cutting him at the 19:39 mark. This one came when a faceoff was won back to Vatanen at the far point. He one-touch passed to Hall, who was set up at the other point. Hall fired on goal and Zajac cleaned up the rebound in the slot. That assist for Hall extended his personal point scoring streak to an amazing 26 games. According to Steve Cangialosi on MSG, the last time Hall failed to register a point was December 30 at the Washington Capitals. He has scored a point in every game he has played in the 2018 calendar year. This was also the first time this season that the Devils had scored four goals in the first period of a game. There would be some crossover penalty time into the second period, as only the first two minutes of the double minor were extinguished when New Jersey scored their second power play goal. Overall on the power play, the Devils were 3-for-5 with eight shots while the Habs were 0-for-2 with three shots on goal. The Devils power play had had some struggles, but now seems to be back on track somewhat. The second period would see four more goals. The first came off the stick of Gallagher, who made a nice power move on Kinkaid’s net to make the score 4-1. He got assists from Jeff Petry and Paul Byron at 10:27 of the second. The Devils would get that one back less than a minute later at 11:36 when Maroon scored his first as a Devil. He got assists from Hall and Palmieri on the power play to make it 5-1. It came when Hall won a draw back to Vatanen at the point. Vatanen faked a shot and passed to Palmieri at the near half wall. Palmieri found a nice seam to Hall at the far faceoff dot. He fired and the rebound came right to Maroon, who gobbled up the rebound and put it home to extend the Devils’ lead to four. That was not all for the Devils’ scoring in the second, either. At 15:14, Brian Boyle scored from Coleman to make it 6-1. It came on the rush with Coleman trying to pass to a cutting Grabner in front of the net on a 2-on-1. Instead, the puck came to a trailing Boyle, who scored his first goal since prior to the All-Star break. The Devils had put up a half dozen on the Canadiens, but that was it for their offense on the night. From there, it was the Habs who were in comeback mode. That started when de la Rose scored with 14 seconds remaining in the second period from Phillip Danault and Jordie Benn. It was 6-2 New Jersey. In the third period, de la Rose would strike again, this time from Andrew Shaw and Mike Reilly at 14:40. The Devils’ lead was now cut in half at 6-3. Byron Froese would score the final goal of the game at 19:01 from Daniel Carr and Reilly. On this one, the Devils did use their coach’s challenge to see if there was goaltender interference, but review showed that the Habs player was pushed into Kinkaid by the Devils’ defender which meant that the call on the ice stood: it was a good goal. It was now 6-4 Devils. Monteal coach Claude Julien would pull Lindgren with about a minute remaining to get the extra attacker, but a well-timed clear and then some pressure from the Devils would result in a win, the 100th of John Hynes’ NHL career. 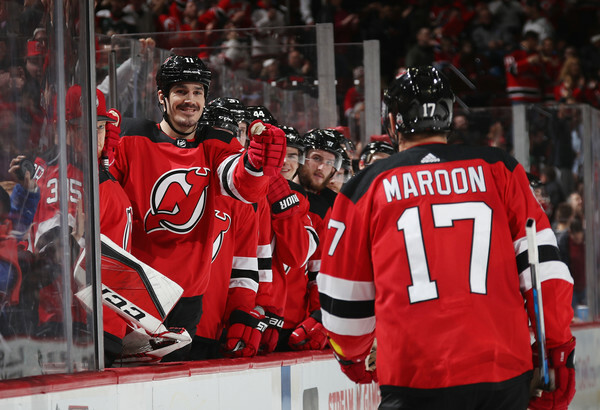 In the end, seven Devils had a multi-point night: Hall, Boyle, Zajac, Coleman, Palmieri, Butcher and Vatanen. Butcher was named the game’s third star while Hall was second and Zajac first, with two goals and an assist for three points. Vatanen would lead the team in ice time with 23:26 total, including 3:10 on the power play and 1:24 on the penalty kill. Hall led in shots on goal with four. Boyle, Stefan Noesen and Ben Lovejoy all had three hits to lead the Devils. John Moore and Greene each had three blocks to lead in that category. Hall led in takeaways with two. The Devils won 52-percent of the game’s faceoffs. Next up, the Winnipeg Jets come to Prudential Center on Thursday in the next stiff test for the Devils, who got points 75 and 76 tpnight. The Jets beat the Rangers tonight off a Patrik Laine hat trick. The Devils will then go on a two week road trip that will see then play some of the best teams, not only in the Western Conference, but in the entire NHL. Hopefully they can play well agaisnt Winnipeg and come away with at least a point in a crucial time in their schedule. If you enjoyed this post, please do not hesitate to follow us on Twitter @LGDevilsNet. You can also email us at LetsGoDevilsNet@gmail.com or leave a comment below the post. Note: the photo of Taylor Hall at the top of this post is copyright Adam Hunger/Getty Images. It could have been a lot worse. The Devils fell in overtime to the Montreal Canadiens at the Bell Centre 2-1 after being shutout by Carey Price through two periods and part of the OT period. But it could have been a lot worse than it was. The news came down today that Taylor Hall is day-to-day following his knee-on-knee hit with the Kings’ Kurtis MacDermid and did not make the trip with the team to Montreal. The Devils did say that there was no structural damage and it was a knee contusion, so they did dodge a bit of a bullet there. But the Devils were still missing most of their offensive firepower: Kyle Palmieri has resumed skating with the team, but is still some time away from returning from his broken foot; Marcus Johansson was placed on IR, eligible to come off on Saturday, with his bruised ankle and now Hall is day-to-day with the knee contusion. Filling in for Hall would be Nick Lappin from AHL Binghamton. He became the first forward call-up this season for New Jersey (Scott Wedgewood was a goalie call-up earlier in the season before he got traded to Arizona). Lappin played the majority of the night on a line with Brian Boyle and Jimmy Hayes. Other than that, the lineup remained largely the same, with Ben Lovejoy and Dalton Prout being the healthy scratches. Between the pipes for the Devils was Cory Schneider. 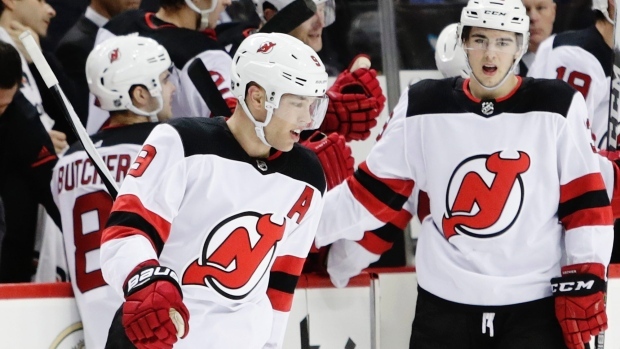 MSG’s Deb Placey reported that John Hynes was strongly hinting that should Cory play well tonight, he would end up getting both games of the back-to-back (the Devils have the Dallas Stars at home tomorrow night). He did, making 34 saves on 36 shots on goal by the Habs. Montreal had Price going for them. He had had a rough outing in his last start on Saturday, being pulled in that game against Edmonton after giving up four goals. He ended up making 31 saves on 32 shots, including stopping three shots while the Canadiens were shorthanded, which included a breakaway by Nico Hischier. Cory began the game with a nice glove save right off the bat on Max Pacioretty. The Devils also got on the board early, with Stefan Noesen scoring at 1:21 into the first period. That goal came when Montreal was on a delayed penalty and the Devils had pulled Schneider for the extra attacker. The Devils played with the puck in their own end until the play developed. Pavel Zacha finally made the outlet pass to Jesper Bratt and Bratt gave to Andy Greene just inside the Habs’ blue line. He pushed forward to Noesen in the slot, who fired a wrist shot top shelf to beat Price and make it 1-0 Devils. But that was it for the Devils’ scoring for the night. Will Butcher hit the post late first period, the first of a few that the Devils would nick. Finally, at 13:31 of the first period, the Habs tied things up when Andrew Shaw scored his eighth of the season from Jordie Benn and Phillip Danault. Interestingly, the Devils will see Benn’s brother, Jamie, when they play Dallas tomorrow night. The Devils had a nice opportunity to regain the lead early in the second period when Byron Froese was called for tripping at 2:52 and then Karl Alzner went off for slashing at 3:47. The Devils would have 1:05 of 5-on-3 power play time. New Jersey had a lot of zone pressure throughout the entire man advantage, but ultimately the Habs killed things off. Just following that power play, there was a mad scramble in front of the Montreal net where the Devils somehow failed to score. Overall, on the power play, both teams went 0-for-3. But that is where the similarities stopped. The Devils fired five shots on goal during their power play attempts while the Devils’ penalty kill completely stifled the Habs power play. The Canadiens ended up with no shots on the power play for the game. Following that 5-on-3, the Devils had an attempt to score, but Blake Coleman hit the iron. The Devils would end the second period with 13 scoring opportunities on 12 shots. Midway through the third period, Hischier broke in on a 2-on-1 with Coleman and ended up missing the net completely. It was a frustrating reminder that the Devils were missing some of their best offensive weapons. With no scoring through the two remaining periods, it was on to overtime. It was there, just 1:52 in, that a Devils breakdown in their own zone allowed Tomas Plekanec to score to give Montreal the full two points. He got assists from Charles Hudon and Alex Galchenyuk. The Devils had escaped with one point, at least and they did so while missing a guy like Hall. They also kept pace in the Metropolitan Division, staying in third place and in a playoff position, but teams like Philadelphia are creeping up, so their next homestand will be very crucial. Individual stats saw Steven Santini lead in ice time with 21:54 (just narrowly edging out Sami Vatanen’s 21:43), Damon Severson lead in shots on goal with five (he was also named the game’s second star for his efforts), Severson and John Moore tying for the hits lead with five hits each and Greene leading in blocked shots with four. Next up, the Devils faceoff with the Dallas Stars tomorrow night at Prudential Center. Dallas has been in the metropolitan area for the last week, so they are already in New Jersey waiting for the Devils. They have gotten wins over the Rangers in a shootout and the Islanders in regulation. It should be an interesting matchup and, hopefully, the Devils can pull out two points tomorrow night in the backend of a back-to-back.